Sunday to Sunday turn overs summer season. Welcome to After Dune Delight in the heart of Kill Devil Hills. At Admirals View III on MP 9, you're directly on the beach and walking distance to a number of some the best restaurants in the OBX (Food Dudes, Bonzers Shack, Dare Devil Pizza, & Kill Devil Grill, just to name a few...). Tucked in between the dunes and on the second floor, you'll have some of the best views of the Atlantic while enjoying a meal on the deck and dolphin watching or getting up early and watching the sunrise. If you're not in the mood for salt and sand, then lounge at the salinity pool without the harsh chemicals or chlorine. When the day is over, relax inside with a full kitchen, Wifi, 3 HDTVs, BluRay, 2 bathrooms, & AC. At After Dune Delight we offer sleeping for 4. The Master bedroom offers a Queen size bed and an adjoining shower bathroom, as well as a private entry onto the deck and great bedroom views of the Atlantic and dunes. The 2nd bedroom offers a twin and full sized bed, as well as close access to the 2nd hall bathroom with bath and shower. Admirals View itself offers a coin laundry, private beach access, outdoor grill pit, outdoor showers, & salinity pool with wood deck. Leave the rat race behind, take a deep breath, and enjoy the sun, the sand, and the views. Pets and smoking NOT permitted at After Dune Delight. Also, although we do not allow pets in our unit, we ourselves have two dogs that travel with us in the off season but ARE NOT ALLOWED on any of the furniture. Although we contract with a professional cleaning company, we cannot guarantee our unit is allergy-free. Thank you for understanding. *** Notice *** Our unit has no landline phone attached to it. In the event of an emergency, you will need access to a cell phone, or you are free to use the Emergency (911) phone in the laundry room on the ground floor of the building. Thank you for your understanding. We love the beach! We love to relax with cocktails in hand and sand in our toes! OBX has been a second home for us for many years and this is truly our happy place :-) We have a private beach access and pool for condo residents only. During off season, only 2 blocks away one can access the beach with a 4 wheel drive vehicle. You can walk or ride your bike almost everywhere! Coin laundry room available on ground floor for guests. Only 2 parking spots are available per unit. Refrigerator and freezer; sorry no ice maker. Blu-ray player in Living Room. YES; however, not heated and only open May through September due to cold temperatures. Located on the property and accessible on the ground floor through the common, central passageway. Just for the Beach is the closest company that rents linens, towels, umbrellas, bikes, etc - http://www.justforthebeach.com/store/locations-store-hours.html Located only 0.2 miles away. We absolutely loved our condo. It was clean and had ample space for a family of 4. My son was most excited about Star Wars Monopoly and Yahtzee that they had there, haha! There were plenty of kitchen accessories and we cooked our meals at the condo 6 out of 7 nights. Loved waking up and being able to see the ocean and even catch dolphins swimming by. The owners were extremely nice and very easy to contact. Highly recommend! We had a great time! Our kids loved the pool! It was never crowded. We enjoyed being able to easily go to the beach and also the pool. Sometimes at night the people upstairs were loud with stomping and moving things around. Thankfully our children were so tired every night that this didn't affect their sleeping. The kitchen was well stocked with the important amenities and the condo was clean. I would recommend a curtain in the living room and some in the bedrooms. The blinds didn't block light very well. My husband and I are not early risers so other people might not find this to be a problem. Very convenient location to shopping, restaurants, and activities. We would stay there again and recommend it to anyone! Thanks! This condo was the perfect size and location for us, and beautifully decorated - very comfortable! Our 4 year old had a great time going back and forth between the pool and the beach. The kitchen was well stocked with appliances and utensils for us to be able to cook meals, but also close to a lot of great restaurants! It’s on the middle floor so there is some noise from above but even with our daughter going to bed early we were fine. We would recommend this condo for any couples or small families looking for a balance between seclusion and activity! We're so happy you all had a wonderful time and hope to welcome you back again soon! Adorable seaside getaway! Our family had a wonderful week celebrating birthdays and our 28th wedding anniversary. I especially enjoyed having my morning coffee on the back porch; the view was perfect. We even had a cool night where we were able to leave the window open overnight and listen to the waves. Best sleep I have had in a long time! Great communication with Eric and Evelyn, and they were always quick to respond. Looking forward to staying here again! Our family had the best vacation we could have hoped for by staying at the After Dune Delight. The condo was cozy and comfortable. It was decorated beautifully, with nice bright colors. It was well maintained and clean. The mattresses were very comfortable. The condo had everything we needed during our stay. We enjoyed the balcony, especially in the morning during the sunrises. We were close to many restaurants, shops, and grocery stores. We really enjoyed our beach access and the pool was always clean and never crowded. We had activities planned everyday, but it was always nice when we got back to the condo to unwind. It was a week full of fun and relaxation. I highly recommend this condo for your next trip and we are sure to go back ourselves in the future. We stayed at at this beautiful condo for our 2nd wedding anniversary last week. We had a wonderful stay, the condo is very clean and beautiful decorated! The view from the balcony is breath taking, my husband and I enjoyed breakfast and coffee with an ocean front view every morning! The private beach access is easily accessible and not crowded and the pool is very nice and clean. We were also in close proximity to the local sight seeing attractions, shopping, and great food! 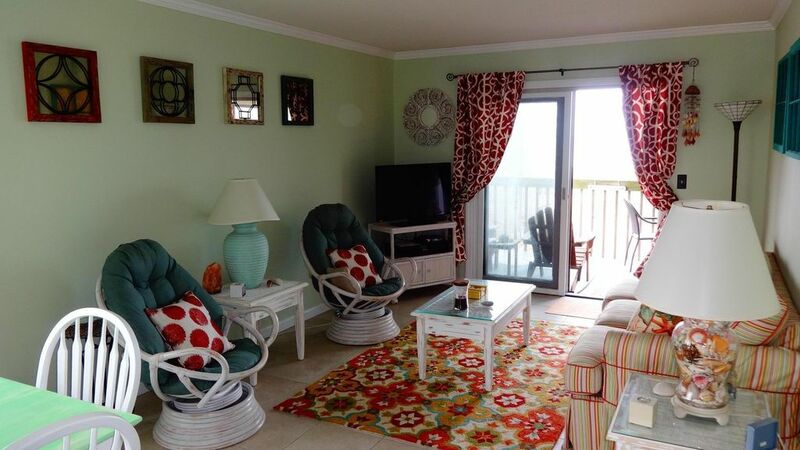 We would recommend this condo to anyone looking for a quiet, relaxing beach trip! Thank you so much for choosing After Dune Delight! We are so happy that you two had a great anniversary <3! Please keep us in mind next time you travel to OBX and your feedback was greatly appreciated! !